Maybe you’ve noticed the Langenfeld logo in some of Terry Redlin’s prints. Langenfeld Ice Cream was a historic business that can be found in many of Terry’s works. Wondering why? He married into it. Terry’s wife Helene is from the Langenfeld family, who owned and operated the business until the early 1960s. Helene's grandfather, Matt Langenfeld, spent years working in creameries in the Midwest before opening his own in 1918. For the next 30 years he manufactured and sold Langenfeld's Ice Cream. Around 1923 or 1924, Langenfeld entered into a partnership with his brother-in-law, Matt Neisen. They established the Marshall Ice Cream Company in Marshall, Minnesota, and sold dairy products under the Perfection Ice Cream label. After Matt Langenfeld’s death in 1949, the Langenfeld heirs purchased the Neisen heirs’ interest in the Marshall Ice Cream Company. The ice cream was then labeled Langenfeld’s Perfection Ice Cream. 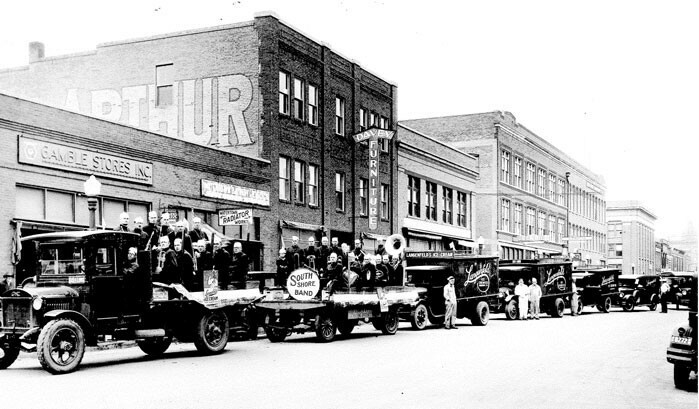 The Langenfeld family manufactured ice cream in Watertown and Mitchell, South Dakota and Marshall, Minnesota. They also had major distribution centers in Rapid City, Aberdeen, Pierre, and Gettysburg, South Dakota, and Montevideo, Minnesota. In the early 1960’s, the family consolidated the ice cream manufacturing at the Mitchell plant. The Langenfeld’s Ice Cream company closed its doors in 1966. The family's legacy lives on today in the Redlin Amphitheater. Bob Wagner, Helene Langenfeld’s cousin, provided his personal collection of family heirlooms to the exhibit. Bob’s father, “Pug” Wagner, the company's ice cream maker, even has hand-written recipes on display. John Langenfeld, Helene’s uncle, donated several other collectibles. The largest antique on display is a beautiful soda fountain donated by Charles Redlin, Terry and Helene’s son. The antiques on display are a fitting addition to the nostalgic scenes in Terry Redlin’s paintings. 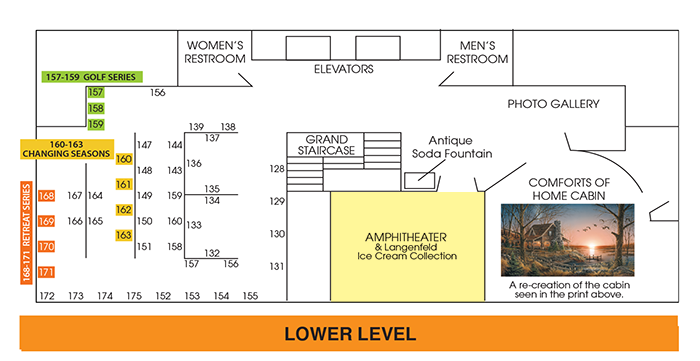 The Langenfeld Exhibit is located on the lower level in the Amphitheater. You can also view the location by downloading our gallery map. Terry Redlin produced 9 paintings featuring Langenfeld Ice Cream: Above the Fruited Plain, Aroma of Fall, Autumn Traditions, Harvest Moon Ball, Hunter’s Haven, Morning Warm Up, Summertime, Total Comfort, and Welcome to Paradise. See them all in the Collection.